Back in my Van Man! driving super-heroism days (see my main about page if you’re vaguely interested), I was fortunate enough to work with Lucy and Andy on occasion. They run Beast Clothing in the fair city of Brizzle (Bristol, UK, for those of you who don’t understand the subtlety of Bristolian colloquialisms). They make T-Shirts and other clothing with local sayings like ‘Gurt Lush’ and ‘Theyz Me Daps Mind’ emblazoned upon them. Beast go to lots of different festivals to sell their wares, and they used to hire me to drive them to events like the Glastonbury Music Festival and Bristol’s very own Harbour Festival. I’d help them set up their stall and then pick them up a few days later when the job was done. The first time I worked for them, I remember Lucy giving me a T-Shirt as a tip. It was the best gratuity I had ever received, for the shirt bore the words ‘Cheers Drive’ upon it. This is one of my favourite colloquialisms, widely used by Bristolians to say, ‘Thank you very much for driving me,’ or, ‘Goodbye, driver, have a wonderful day,’ to the driver of any vehicle. So when getting off a bus or out of taxi, you might say, ‘Cheers, Drive,’ to the driver as you depart. Or if you’re a driver undertaking deliveries, anyone in a warehouse will simply refer to you as, ‘Drive’. When you’re loaded up and ready to go they say, ‘Cheers, Drive,’ in recognition of your imminent departure. So, being a driver and receiving this particular shirt was an absolute joy. It led onto my (rather brief) career as a male model. Hard to believe looking at me, but true. On the Beast website, they have a section where people can send in pictures of themselves wearing Beast clothing in exotic and interesting places. So, while in New York at a friend’s wedding, my wife and I went up the Empire State Building and I had my picture taken wearing my Cheers Drive T-Shirt. When I got home, I sent it to Lucy for them to use on the website and didn’t think much more of it. A couple of months later, I went to pick Andy and Lucy up at the shop to take them and all their kit to some festival or other. Upon arrival, Lucy handed me a copy of The Big Issue. 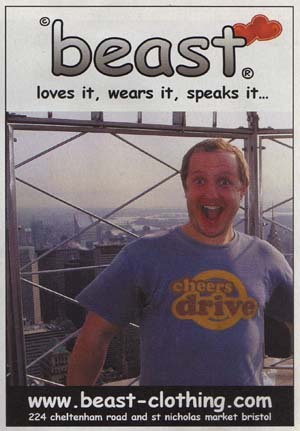 In it was an advert for Beast Clothing featuring moi. It was a shock, but a nice surprise. I could now relate to Zoolander, and looked on the whole movie in a completely different light. A year or two later, I found myself wearing a ‘Pick Ee Out The Stingerz’ T-Shirt (this is a colloquialism referring to picking one's nose (gurt lush, like)) while on holiday in Germany with the lads on our motorbikes. By chance, I walked past a patch of stinging nettles. A picture was snapped and I sent it to Lucy. This picture was also used as an advert and is still used on the website today for that particular T-Shirt. That’s it really. Bit of a crap ending, but that was my male modelling career, although I have a ‘Gurt Lush’ T-Shirt request on my Christmas list, so I might restart my posing in 2013. We shall see. Are You a Beast Clothing Model? If you are bestowed with the looks of a golden haired god and have been selected as a Beast Clothing model, please get in touch and share your experiences!